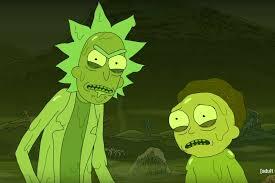 The, "Toxic," versions of Rick and Morty. They ironically reflect some of the worst members of the fan-base. I love the television program, "Rick and Morty." I sometimes am nervous to express this in public however as the show has become notorious for a chunk of its fan-base being people who behave abhorrently, and I fear someone thinking I'm one of those fans who believe Rick is someone to be modeled after as opposed to hated and pitied, or who lined-up and screamed at McDonald's restaurants when they ran out of Schezwan sauce (which actually did taste pretty good). I also have enjoyed the, "Star Wars," films, finding the original trilogy to be great fun, not hating, "Episode 3," and being relatively pleased with, "Episode VII." I still haven't seen the spin-off movies or the latest main-flick but I will get around to doing so at some point. There are other people who obsess over, "Star Wars," however, and it has developed a fan-base which can at times be so toxic it has harassed writers, actors, and others to a disgusting degree. I love being a fan of things, but I"ll be damned if toxic fandoms don't make being a fan hard. The word, "Fan," is basically a shortened and colloquial version of the word, "Fanatic." Basically, fanaticism is bad if looking at a strict definition of the word, as it means you are dangerously obsessed with something, worshiping it to a degree. As with many words and phrases its modern usage just means you really like something, but maybe there is more and more accuracy in the old definition. After all, fanatics of something would love their interpretation so much anything that challenged it they would hate and attack...much like some of the toxic fandoms today despising anything done with/to their beloved intellectual property that they disagree with. Pretty much any somewhat-popular show, movie, book-series, comic, video-game, and so forth will have an element of its fan-base that can be toxic, but the problem arises when there is a good deal of toxicity, and it seems to overpower and overwhelm the much less hateful majority of folk. Still, when a toxic fandom seems to saturate the discussion it really makes being a fan hard. I don't have a solution, if I did I sure as Hell would offer it to any fandoms overloaded with toxicity. I just wanted to vent and advise others to call out toxic people in a fan-community when they see such behavior. Make sure it is known that their horrendous behavior won't be tolerated because if they claim to love something so much all they want to do is hate-on anyone else who likes it too (and maybe likes different aspects, even) then they aren't fans, they're just jerks. I agree. My first issue with Rick and Morty is that I was screening one episode for my teens to be able to watch and I realized it's grossly innaproptiate and not a show my teens can watch yet. 2nd is the people that I know of who like it are unsavory (yourself excluded) and I think..i that is what keeps me from watching it enough to become a fan. Yes Mary, I feel like, "Rick and Morty," is one of those shows that if teens (and clearly some adults) view it without a proper context provided they may completely miss the actual point. Within the gross-out humor and Rick being a jerk it is made clear by the program he is lonely and sad man. There is a fan-base that seems to miss this and think he is the hero of the show when it has been made clear multiple times he is the villain. It is like people who watch, "Scarface," and want to emulate Tony Montana whilst ignoring how the movie ends with him (spoiler alert) killing his best friend in a jealous rage, having his sister hate him, and being murdered all due to his wanting to be a big-name drug-lord.